The current recession has led to sharp increases in unemployment for all groups of workers. Unemployment among Hispanics increased more than for non-Hispanics from the third quarter of 2007 to the third quarter of 2008. Also, the unemployment rate for native-born Hispanics rose more than the rate for foreign-born Hispanics. However, increases in measured unemployment for immigrant Latinos were dampened by their apparent exit from the labor force in large numbers. Absent their withdrawal from the labor force, the unemployment rate for foreign-born Latinos may have registered the largest increase among all groups of workers. Growth in employment has come to a halt in the ongoing recession. The U.S. economy employed 146.7 million workers in the third quarter of 2007 and 146.4 million workers in the third quarter of 2008 (Table 5). That represented a loss of more than 200,000 jobs. While this was not a statistically significant change, it was a sharp turnaround from the period before the recession. From the first quarter of 2007 to the first quarter of 2008, the economy had added nearly 700,000 jobs (Kochhar, 2008). The most notable manifestation of the recession is the addition of 2.2 million workers to the ranks of the unemployed. Consequently, the unemployment rate climbed from 4.7% in the third quarter of 2007 to 6.1% in the third quarter of 2008. The increase in unemployment also means that a smaller proportion of the working-age population is now employed. That can be seen in the decline in the employment rate, from 63.4% in the third quarter of 2007 to 62.5% in the third quarter of 2008. The increase in the unemployment rate was much greater for Hispanics than for non-Hispanics. For Latinos, the unemployment rate increased by 2.2 percentage points, from 5.7% in the third quarter of 2007 to 7.9% in the third quarter of 2008. The unemployment rate for non-Hispanics increased by less and remains well below the rate for Hispanics. It increased from 4.6% in the third quarter of 2007 to 5.8% in the third quarter of 2008. Neither Hispanics nor non-Hispanics registered significant changes in employment in the past year. 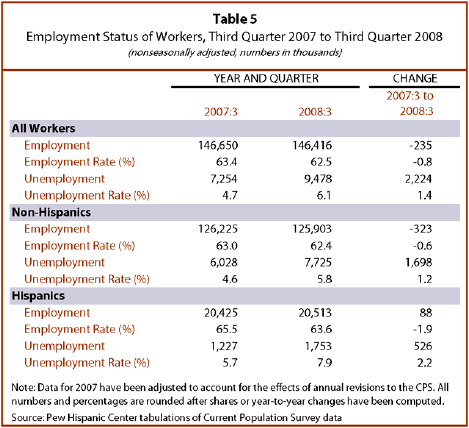 As a result, smaller proportions of both populations were employed in the third quarter of 2008 compared with the third quarter of 2007. For Hispanics, the employment rate fell from 65.5% to 63.6%, a decrease of 1.9 percentage points (Table 5). For non-Hispanics, the employment rate fell from 63.0% to 62.4%, a decrease of 0.6 percentage points. Both native-born and foreign-born Hispanics have felt the effects of the recession. While the estimates suggest a modest growth of 178,000 in employment for native-born Hispanics and a decline of 90,000 jobs for foreign-born Hispanics, neither change was statistically significant. For both groups of workers, however, there were significant increases in unemployment and significant decreases in the shares who were employed. 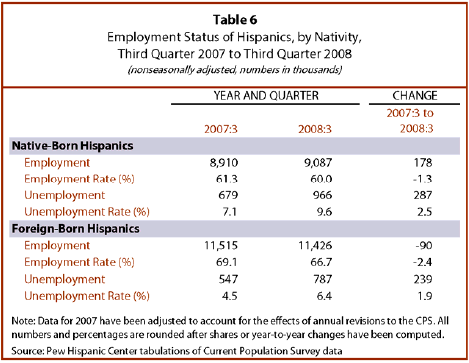 The unemployment rate for immigrant Latinos increased from 4.5% to 6.4% from the third quarter of 2007 to the third quarter of 2008 (Table 6). The increase in the unemployment rate would have been even greater if not for the fact that many foreign-born Latinos withdrew from the labor market (see Table 2 above). If a worker withdraws from the labor force — in other words, does not actively look for employment for any reason — that worker is not counted as unemployed. By reducing their labor force participation rate, foreign-born Latinos, in effect, curbed the observed increase in their unemployment rate. If immigrant Hispanics had maintained the same level of labor force participation in the third quarter of 2008 as in the third quarter of 2007 (72.4%), 185,000 more workers would have been added to the ranks of the unemployed in the period. As a result, the unemployment rate for foreign-born Hispanics in the third quarter of 2008 would have been 7.8%, not 6.4%, and their unemployment rate would have increased by as much as 3.3 percentage points. The unemployment rate for native-born Hispanics is now approaching double digits. Starting at 7.1% in the third quarter of 2007, the unemployment rate for native-born Latinos shot up to 9.6% by the third quarter of 2008, an increase of 2.5 percentage points. The experiences of Mexican-born workers reflect the trends for the foreign-born Hispanic workforce. That is not surprising because Mexican-born workers account for two-thirds of Latinos immigrants in the workforce. 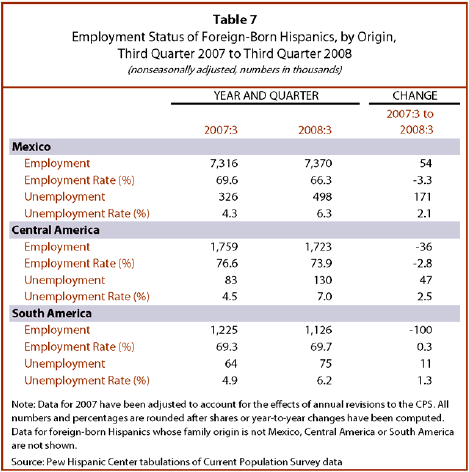 Thus, there was no significant change in the employment of Mexican-born workers from the third quarter of 2007 to the third quarter of 2008. Absent employment growth, the proportion of the Mexican-born population that is employed fell sharply from 69.6% to 66.3%, a 3.3 percentage point decrease since the third quarter of 2007 (Table 7). The number of unemployed Mexican-born workers increased from 326,000 in the third quarter of 2007 to 498,000 in the third quarter of 2008. That led to an increase in the unemployment rate from 4.3% to 6.3% (Table 7). As noted above for all foreign-born Latinos, the unemployment rate for Mexican-born workers would have increased even more if their labor force participation rate had remained unchanged from the third quarter of 2007 to the third quarter of 2008. Under those hypothetical circumstances, it is estimated that the unemployment rate for Mexican-born workers, which was 6.3% in the third quarter of 2008, would have been as high as 8.9%. Newly arrived foreign-born Hispanics — those who arrived in 2000 or later — registered the largest decline in the employment rate among the various groups of workers examined in this report. These immigrants secured 247,000 new jobs in the past year (Table 8). But these gains notably lagged behind the growth in their working-age population, and their employment rate fell from 70.3% in the third quarter of 2007 to 66.8% in the third quarter of 2008, a decline of 3.5 percentage points. Newly arrived Latino immigrants also added 78,000 workers to the unemployment rolls. Thus, the unemployment rate for these workers jumped from 5.5% to 7.2% from the third quarter of 2007 to the third quarter of 2008. 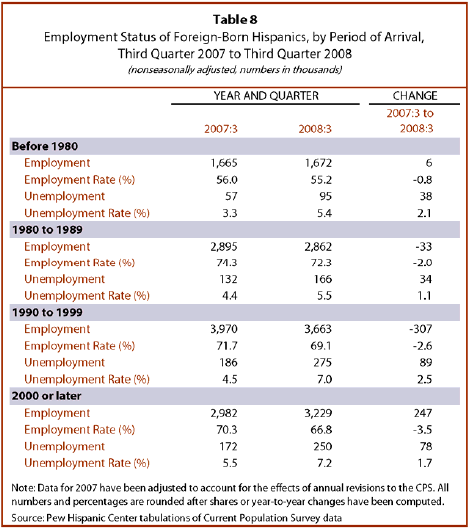 Immigrant Hispanics who arrived between 1990 and 1999 lost 307,000 jobs since the third quarter of 2007 (Table 8). That trend is consistent with the decrease in the working-age population and labor force of this group (Table 4). As noted above, this may be due, at least in part, to the emigration of some of these workers. For these workers, the unemployment rate increased from 4.5% to 7.0% from the third quarter of 2007 to the third quarter of 2008.